Robert Indiana's multi-colored floor, the 11,052-seat intimacy and the Bucks incredible home-court advantage (winning more than 81 percent of their home games). Next to the Boston Garden and Chicago Stadium, no arena gave visiting teams such violent shakes. The MECCA Arena may be no more (it's now the Wisconsin Center Arena -- bleah!) but it deserves a place in your site. Amusement Business The former home of the 1970-71 NBA World Champion Milwaukee Bucks and the 1977 NCAA Champion Marquette University Warriors has undergone a complete overhaul that includes refurbished seats, a new basketball floor, power and lighting upgrades, a new scoreboard/video screen and improved disability access with new seating platforms. Primary tenants in the 1990s are the Marquette women's basketball team and the University of Wisconsin-Milwaukee Panthers men's team. Milwaukee Arena, which will have a name change in future months when naming rights are secured, has total capacity of 12,200 with 8,946 permanent seats. The Marquette men will play two games at the arena in 1998-99 and Wisconsin Center District officials will negotiate future dates with the school beyond next seasson now that the 10-year no-compete clause with neigboring Bradly Center has expired. Renovated concessions stands, wider concourses equipped with new TV monitors and new paint and finishes throughout the facility are also part of the capital improvements project. "The arena was built in 1950 and people have such a love for it with wonderful memories of pat events," said Lange. The building continued to operate during the renovation with basketball, concerts, consumer shows, circuses and motorsports. The new basketball floor, produced by Power Lock Protable Floor Company, was painted in a modified version of the Robert Indiana "MECCA Arena" design that attracted nationwide attention when unveiled in 1977. The $1 million White Way scoreboard contains four Toshiba video walls that may be used for private parties, conventions and lectures. "With our in-house production team, we have the ability to produce the videotapes and sell them. It's another revenue source," said Lange. All arena entrances are now color-coded to make it easier for the public to remember at whcih door they arrived. "For faster, more efficient (concessions) service, we took the meeting rooms out along with the old cocktail lounge," said Geyer. "Originally, this was not the city's idea. It was staff making recommendations. Again, we know the client's needs." The permanent concession stands have new countertops and enclosures with new equipment and revised layouts. Sections of counters were lowered to accomodate disabled patrons. The arena's refrigerated beer line system was cleaned, repaired and refurbished. The main ceiling bowl and roof was painted black "to draw attention to the floor," said Geyer. New acoustical tiles were installed in concourse areas and in the main box office lobby. The arena'a custom-built house sound system underwent improvements with tuning and adjustments to accommodate acoustical changes resulting from other renovations "Pavarotti and Neil Diamond loved it, said Lange. On October 5, 2004 Nick Waldron wrote: Hey, great site. �I just wanted to send you this link and say a few words about my favorite indoor venue, The MECCA Arena. Unfortunatley, it's now officially known as U.S. Cellular Arena, but around here, everyone still calls it The MECCA Arena. In fact, the name MECCA Arena has even more of a meaning now since it's probably the best pure basketball facility left in North America. Of course, that's taking for granted that you'd be there to actually watch a basketball game and not to eat sushi in a luxury box (of which the MECCA Arena has none). But for a real hoops fan, what's not to love about The MECCA Arena? There's not a bad seat in the entire arena. It was built with basketball in mind and provides excellent sightlines from no matter where you sit. And even though it has a capacity of 12,200, it feels like it's much smaller. That's because every seat is as close to the floor as possible, so you feel like you're right on top of the action. That's something that we lost (and are just now starting to get back) when economics forced the Bucks into the Bradley Center in 1988. 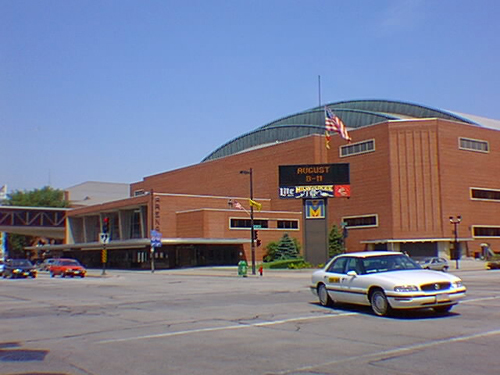 The Bradley Center was built to attract an NHL team to Milwaukee which never did surface. And since the seats are positioned with hockey in mind, it feels remote and distant compared to The MECCA Arena. Unfortunatley, that also means The MECCA Arena's days might be numbered. Sen. Kohl just signed a lease to keep the Bucks in the Bradley Center for another 8 years, but expressed that he'd like a new venue shortly thereafter since the Bradley Center would be 24 years-old (Milwaukee should be ready for a new arena by then anyway). However, that means The MECCA Arena would most likely be demolished since it makes no sense to have three mid-large arenas in the same metro area. Especially when we're not even one of the bigger cities. Fortunatley for now though, the UW-Milwaukee mens hoops team has taken up residence at The MECCA Arena giving fans my age the opportunity to experience either what we missed or what we were too young to appreciate.